Among all mental health disorders in the general population, anxiety is the most frequent. According to results from population-based surveys, approximately one third of the population is affected by an anxiety disorder during their lifetime. Anxiety can be defined as a subjective feeling of tension, apprehension, nervousness, and worry accompanied by physiological arousal. It is important to manage anxiety because it is systematically associated with negative outcomes such as quality of life (QOL) impairment, functional impairment, and lower productivity. The Global Burden of Disease study 2010 (GBD 2010) estimated that anxiety disorders contributed to 26.8 million disability adjusted life years. There are several pharmacological and non-pharmacological interventions for managing anxiety in various settings. Although pharmacological interventions such as selective serotonin reuptake inhibitors (SSRIs) have been traditionally used in the treatment of anxiety, some cannot use these drugs because of side-effects or interactions and others prefer not to use any medications., Recently, a range of non-pharmacological methods, such as aromatherapy, massage therapy, relaxation techniques, and music therapy, have been implemented to reduce anxiety. The use of music as a therapeutic approach has an old history. Inscriptions in ancient Egypt, Greece, China, India, and Rome described music as a healing agent with a relaxing effect that reduces anxiety and creates relaxation. The anxiolytic effects of music interventions on patients undergoing invasive procedures, cancer patients, and those suffering from Alzheimer's disease are confirmed in various studies. [,, Although the use of music as a healing agent is not a new phenomenon, there has been scant research on religious music. The available studies indicate that religion and religious music may have a positive effect on mental health. The Quran is the Holy book of Muslims; it covers all aspects of human life. Recitation of the Holy Quran is a form of mystical music that contributes to the release of endorphins by stimulating alpha brain waves. Therefore, it enhances the stress threshold, removes negative emotions, and creates a sense of relaxation. Hence, due to the importance of Holy Quran in Muslims' lives and the growing interest in non-pharmacological interventions by focusing on religion among researchers, this systematic review was performed to assess the studies that evaluated the effect of Quran recitation on anxiety in various settings. 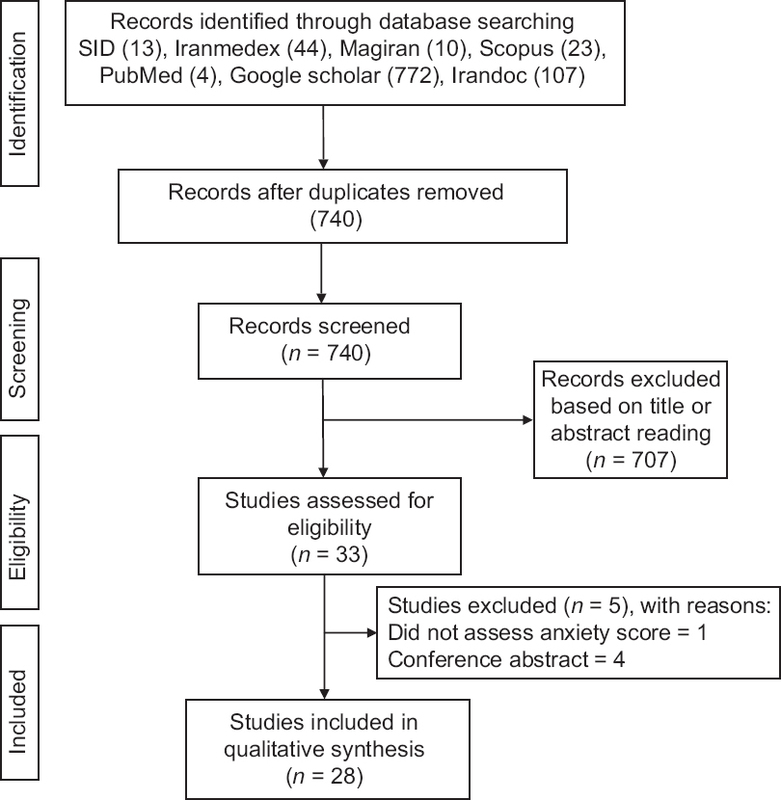 In this systematic review, national and international databases including SID, Iranmedex, Magiran, IranDoc, Scopus, and PubMed were searched in September 2017. Key words and MeSH terms such as “Quran,” “anxiety,” “clinical trial,” and Boolean operators “AND” and “OR” were used for searching in English databases. Persian terms equivalent to these English terms were used for searching in national electronic databases. To ensure that no relevant articles were missed, we also searched Google Scholar using both Persian and English search terms. All documents that were published between January 1990 and September 2017 were retrieved. Randomized controlled trials and quasi-experiments met the inclusion criteria if they assessed the effect of Quran recitation on anxiety. The studies conducted on healthy participants, patients with chronic diseases, or patients undergoing an invasive procedure were included. There was no age or gender restriction. If we could not retrieve the full text format of an article, we included its abstract only when it had sufficient information. Studies that were not published as full papers, such as conference abstracts were excluded. Two steps were taken to determine the eligibility of papers according to the inclusion criteria. First, the title and abstract of the identified papers were independently screened by two reviewers. Second, full texts were obtained for all potentially relevant articles. Disagreements were resolved by discussion between reviewers. The following information/data were extracted from studies that met the inclusion criteria: author(s) and year of publication, setting, sample size, participants, study methodology, outcome measures, and key findings. The risk of bias in each included study was assessed using the Cochrane Collaboration's risk of bias tool. The criteria consist of selection bias, performance bias, detection bias, attrition bias, and reporting bias. Each item was classified as “low risk of bias,” “high risk of bias,” or “unclear risk of bias.” Any discrepancy between the two reviewers were resolved by a discussion. The study was approved by the Ethics Committee of Shahroud University of Medical Sciences with the ethical code IR.SHMU.REC.1396.150. A total of 973 articles were retrieved on initial search query. After excluding 233 duplicates and 707 irrelevant articles, 33 studies remained for full-text evaluation. Of these, 5 were excluded because one of them did not assess the anxiety level and the others were abstract from conference. Finally, 28 studies (26 articles, 2 master's theses) were considered for systematic review. The flowchart used for retrieving the included articles is shown in [Figure 1]. All the included studies were published between 1997 and 2017, and the total number of participants was 2,108, with a range of 24–180 per study. The study designs were a two-arm parallel group (n = 21),,,,,,,,,,,,,,,,,,,,, a three-arm parallel group (n = 6),,,,,, and a single-arm group (n = 1). Fifteen studies assessed the effect of Quran recitation on anxiety in participants before an invasive procedure such as cesarean section,,, induction of general anesthesia,, open heart surgery,, general surgery,, cardiac catheterization,, endoscopy, lithotripsy, hemodialysis, and any invasive procedure. In addition, five studies on student test anxiety,,,,, two on athletes' anxiety,, two on the anxiety of patients hospitalized in intensive care units,, one on women's anxiety during pregnancy, one on women's anxiety during first stage of labor, one on nursing students' anxiety before entering the clinical practice, and one study on prisoners' anxiety were conducted. The State-Trait Anxiety Inventory (STAI) in 22 studies,,,,,,,,,,,,,,,,,,,,,, the Test Anxiety Scale (TAS) in two studies,, the Beck Anxiety Inventory (BAI) in two studies,, the Competitive State Anxiety Inventory (CSAI) in one study, and the Zung Self-Rating Anxiety Scale (SAS) in one study were used to assess the level of anxiety in participants [Table 1]. A study performed by Ghorbani et al. demonstrated that listening to the Quran recitation significantly reduced the anxiety level in the intervention group compared with the control group. The research of Qasemtabar et al. confirmed the results of study by Ghorbani et al. A study by Heidari and Shahbazi showed that anxiety level in nursing and emergency medicine students was significantly lower during exams with Quran recitation than the exams without it. A study by Masoumy et al. on the medical students' test anxiety revealed that Quran recitation was significantly more effective than music sound. Moreover, Ramazani et al., in a quasi-experimental study, stated that Quran recitation was effective in reducing pre-test anxiety level of medical sciences students. Findings of the study performed by Pour Dehkordi et al. indicated that both relaxation muscle therapy and listening to Holy Quran recitation along with reciting God's name were effective on reducing anxiety level of nursing students before entering the clinical practice. Mottaqhi, et al. in their study stated that Quran recitation significantly reduced anxiety level of female university athletes. Another study by Aghamohamadi et al. showed that female university athletes who listened to Quran recitation had lower anxiety level than the control group but this difference was not statistically significant. Akbari et al. assessed the effect of Quran recitation on prisoners' anxiety. They found that intervention group had significantly lower anxiety level than the control group. Study by Jabbari et al. on 168 pregnant women showed significant reduction in anxiety level of both intervention groups, one that listened to Quran recitation with translation and another that listened to Quran recitation without translation, when compared with the control group. Sahmeddini et al. reported in their study that listening to the recitation of the Holy Quran during the active phase of labor had a positive effect in reducing anxiety. Study conducted by Khatooni showed that listening to the recitation of the Holy Quran had a positive effect in reducing anxiety level of patients hospitalized in the cardiac care units. A study performed by Najafi et al. showed that listening to Holy Quran recitation along with lavender aromatherapy was effective in reducing anxiety level of patients suffering from myocardial infarction. In the study by Nikbakht Nasrabadi et al., it was found that listening to Holy Quran recitation had a positive effect on lowering the level of anxiety among patients hospitalized for invasive procedures. Tajvidi et al. found that Holy Quran recitation was effective in reducing patients' anxiety before open heart surgery; this had been confirmed by the research of Ildarabadi et al. A study by Heidari and Shahbazi showed that listening to Quran was more effective in reducing anxiety before endoscopy procedure than listening to instrumental music. Babaii et al. in their study found that Holy Quran recitation decreased patients' anxiety before cardiac catheterization. Mirsane et al. demonstrated that listening to Quran recitation and its translation could reduce patients' anxiety before general surgery. Atari et al. demonstrated that listening to Holy Quran recitation decreased the anxiety score of patients before anesthesia induction. Another study by Shafiei et al. on patients' anxiety before induction of general anesthesia indicated that Holy Quran recitation with translation was significantly more effective than the same without translation. Results of Majidi's study showed the positive effect of listening to Holy Quran in reducing anxiety level of patients hospitalized for angiography. In another study, Babamohamadi et al. found that listening to Holy Quran recitation had a positive effect in reducing anxiety of patients undergoing hemodialysis. Mirbagher Ajorpaz et al. found that both Quran recitation and instrumental music significantly reduced anxiety level of patients before abdominal surgery. A study by Sharafi indicated that Holy Quran recitation compared with the Arabic music had a positive effect in lowering patient's anxiety before lithotripsy. Sharifi et al. reported in their study that both Quran recitation and instrumental music reduced anxiety score of women before cesarean section. However, the recitation of Holy Quran was significantly more effective. Allameh et al. indicated the positive effect of Quran recitation in reducing anxiety score of women undergoing cesarean section, this had been confirmed by the research of Mirbagher Ajorpaz and Ranjbar. Eight trials described randomization procedures, using random number table,, block randomization,,, throwing coins,, or computer generation of random numbers. The other trials did not describe the sequence randomization process. Only three trials were considered at low risk of bias for allocation concealment.,, The other trials were rated “unclear,” as they did not have clear descriptions of their method of allocation concealment. All included studies failed to provide information about the blinding of participants, personnel and outcome assessors. All studies were judged to have a low risk of bias for incomplete outcome data; all studies had no participant losses, or the missing data were balanced in numbers across intervention groups. As far as we could see, all studies included were free of selective outcome reporting and other potential sources of bias. See [Figure 2]; “Risk of bias” graph and [Figure 3] “Risk of bias” summary of included studies. This study aimed to systematically review studies that assessed the effect of listening to Holy Quran recitation on anxiety in various settings. Religion is an important socio-emotional resource and listening to religious music is an important part of religious life. One of the most wonderful aspects of miraculous Quran is the sounds of reading Holy Quran's verses. Findings of our review revealed a positive effect of listening to Holy Quran recitation in reducing anxiety score in various settings. Only in one study that was conducted on female university athletes, anxiety level in experimental group was less than that of the control group but it was not statistically significant. Relatively little research has addressed the relationships between listening to religious music and physiological processes. A study by Bradshaw et al. showed that listening to religious music among elderly people was associated with a decrease in death anxiety, and positively influenced in life satisfaction, self-esteem, and a sense of control over their lives. During the past two decades, various studies have been carried out on therapeutic effect of Holy Quran recitation in Iran. Mahjoob et al. in their study found that Quran listening without its musical tone had a positive effect on the mental health of personnel in a medical sciences university. The research by Shirvani et al. showed that listening to Holy Quran recitation stabilized vital signs and increased arterial oxygen pressure of unconscious patients in ICUs. Keshavars et al. in their study aimed to assess the effect of Holy Quran recitation on physiological responses of premature infant found that pulse rate and respiratory rate significantly reduced in the intervention group compared to the control group. Ansari Jaberi et al. found that listening to Holy Quran recitation had a positive effect in reducing depression. Based on the results of this systematic review and other studies we can help people to decrease their anxiety by getting help from Holy Quran. Therefore, healthcare teams should consider Holy Quran recitation as an intervention, as this is an example of the holistic paradigm in health and the effects of such an intervention should be considered in a multidisciplinary and patient-centered approach. This highlights the need for education and training based on an ethical background that is very important when dealing with religiosity or spirituality. This study has some limitations. We could not find any evidence assessing the effect of Holy Quran recitation on anxiety in other Islamic countries. Hence, this systematic review focused on studies that conducted in Iran. The low methodological quality and the high heterogeneity of the included studies mean that our findings must be interpreted with caution. The current evidence indicates that listening to Holy Quran recitation is a useful non-pharmacological treatment for reducing anxiety. However, due to the limited number of studies in this area, further research is needed to obtain more accurate evidence. The authors would like to thank the Student Research Committee at Shahroud University of Medical Sciences. Lenze EJ, Wetherell JL. A lifespan view of anxiety disorders. Dialogues Clin Neurosci 2011;13:381-99. Ravindran LN, Stein MB. The pharmacologic treatment of anxiety disorders: A review of progress. J Clin Psychiatry 2010;71:839-54. Mondin TC, Konradt CE, Cardoso Tde A, Quevedo Lde A, Jansen K, Mattos LD, et al. Anxiety disorders in young people: A population-based study. Rev Bras Psiquiatr 2013;35:347-52. Remes O, Brayne C, Linde R, Lafortune L. A systematic review of reviews on the prevalence of anxiety disorders in adult populations. Brain Behav 2016;6:e00497. Ferguson JM. SSRI antidepressant medications: Adverse effects and tolerability. Prim Care Companion J Clin Psychiatry 2001;3:22-7. Carroll DL, Malecki-Ketchell A, Astin F. Non-pharmacological interventions to reduce psychological distress in patients undergoing diagnostic cardiac catheterization: A rapid review. Eur J Cardiovasc Nurs 2017;16:92-103. Jasemi M, Aazami S, Zabihi RE. The effects of music therapy on anxiety and depression of cancer patients. Indian J Palliat Care 2016;22:455-8. Guetin S, Portet F, Picot MC, Pommie C, Messaoudi M, Djabelkir L, et al. Effect of music therapy on anxiety and depression in patients with Alzheimer's type dementia: Randomised, controlled study. Dement Geriatr Cogn Dis 2009;28:36-46. Kim Y, Evangelista LS, Park YG. Anxiolytic Effects of Music Interventions in Patients Receiving Incenter Hemodialysis: A Systematic Review and Meta-Analysis. Nephrol Nurs J 2015;42:339-47. Nightingale CL, Rodriguez C, Carnaby G. The impact of music interventions on anxiety for adult cancer patients: A meta-analysis and systematic review. Integr Cancer Ther 2013;12:393-403. Bradshaw M, Ellison CG, Fang Q, Mueller C. Listening to religious music and mental health in later life. Gerontologist 2014;55:961-71. Almerud S, Petersson K. Music therapy--a complementary treatment for mechanically ventilated intensive care patients. Intensive Crit Care Nurs 2003;19:21-30. Chang MY, Chen CH, Huang KF. Effects of music therapy on psychological health of women during pregnancy. J Clin Nurs 2008;17:2580-7. Higgins JP, Green S. Cochrane hand book for systematic reviews of interventions. John Wiley & Sons; 2011. Mirbagher Ajorpaz N, Ranjbar N. Effects of recitation of holy Quran on anxiety of women before cesarean section: A randomized clinical trial. Qom Univ Med Sci J 2010;4:15-9. Mirbagher Ajorpaz N, Aghajani M, Shahshahani M. The effects of music and Holy Quran on patient's anxiety and vital signs before abdominal surgery. Evidence Based Care 2011;1:63-76. Najafi Z, Tagharrobi Z, Taghadosi M, Sharifi K, Farrokhian A. The Effect of Simultaneous Aromatherapy and Quran Recitation on Anxiety Level of Patients with Myocardial Infarction. Complement Med J 2014;4:700-12. Mirsane SA, Kheirkhah D, Shafagh S, Mirbagher Ajorpaz N, Aminpour J. The effect of listening to Vaghe'a Surah and its translation on the state and trait anxiety before general surgeries: A Randomized Controlled Clinical Trial. Health Spiritual Med Ethics 2016;3:12-7. Aghamohamadi M, Nazar ali P, Hanachi P. The Effect of Voice of the Holy Quran on Cortisol, ACTH and Psychological Factors During one Maximal Exercise in Young Female Athletes. ZUMSJ 2014;22:110-8. Sharafi E. Quran sound impact on patients anxiety before lithotripsy surgery in the Baqiyatallah hospital [MSc Thesis]. School of Nursing and Midwifery, Shahid Beheshti University of medical sciences, Iran; 2000. Tajvidi M, Mohammadi E, Memarian R. The effect of Holy Quran's song on the patient's anxiety before the heart surgery. Daneshvar Med 2001;8:55-60. Khatooni A. The effect of voice of the Holy Quran on anxiety in patients admitted to cardiac care units in a selected hospital in Tehran, 1997. [MSc thesis]. School of Nursing and Midwifery, Iran University of Medical Sciences, Iran; 1997. Sharifi A, Alipour A, Baharloei S. Comparison of the effect of instrumental music and voices of holy Quran on anxiety of woman before cesarean. J Urmia Nurs Midwifery Fac 2013;10:0-0. Poor Dehkordi H, Jafari A, Solati S. Comparison of relaxation and Quran tone, God mention effect on anxiety among nursing students in entering to training in Shahre Kord Medical Sciences University. Teb Tazkieh 2008;16:56-64. Heidari M, Shahbazi S. Effect of Quran and music on anxiety in patients during endoscopy. Knowledge and Health. J Knowl Health 2013;8:67-70. Heidari M, Shahbazi S. An assessment of the effect of recitation of the Quran on exam anxiety in nursing and emergency medicine students. Strides Dev Med Educ 2015;12:56-63. Allameh T, JabalAmeli M, Lorestani K, Akbari M. The Efficacy of Quran Sound on Anxiety and Pain of Patients under Cesarean Section with Regional Anesthesia: A Randomized Case-Controlled Clinical Trial. J Isfahan Med Sch 2013;31:601-10. Atari M, Sajedi P, Heydari S. Evaluation of Koran voices effect on anxiety and vital signs of patients in preinduction Stage. Teb Tazkieh 2000;37:91-4. Ghasemtabar SN, Fayyazi I, Ghasemtabar SA, Omidi H. The effect of Quran recitation on the anxiety before exam of the students. Islamic Education J 2013;8:101-16. Masoumy M, Ganjou M, Akbari Z. A comparative Study on the Effects of Holly Quran and Music Sound on Students Text Anxiety. CMJA 2013;3:471-80. Nikbakht Nasrabadi A, Jafari Gholam H, Naji H. Investigating the effect of Quranic voice on reducing anxiety before and after diagnostic and therapeutic operations in different surgical and internal surgeries of Alzahra, Kashani and Imam Hossein hospitals of Golpayegan. Teb Tazkieh 1998;1:78-84. Shafiei N, Salari S, Sharifi M. Comparison between hearing the Quran Arabic voice and Arabic voice with Persian meaning on decreasing the anxiety and vital signs stabilization of patients before induction of anesthesia. Quran Med 2011;1:11-5. Majidi S. Recitation effect of holy Quran on anxiety of patients before undergoing coronary artery angiography. J Guilan Univ Med Sci 2004;13:61-7. Ildarabadi E, Mazloom S, Saleh Moghadam A, Elmi M, Ghanbari b, Elmi M, et al. Effect of listening to the Holy Koran on patients' anxiety before open heart surgery. J Mashhad School Nurs Mid 2004;5:15-20. Ramazani AA, Hedayati SP, Abbaspour O. Effect mercy verses of Quran voice on the level of anxiety in Zabol University of medical sciences' students before the exam. JRH 2014;2:24-30. Ghorbani F, Ghorbani Z, Avazeh A. The Effect of Listening to the Holy Quran on the Level of Pre-Exam Anxiety of Secondary School Students in Zanjan City, in 2011. ZUMSJ 2014;22:89-96. Sahmeddini MA, Zamani Lari M, Nabi Rahimian M, Danaei L, Beigi N, Habibi H. The Effect of Listening to the Quran on Serum Cortisol Levels and Anxiety in Primiparous Women during the First Stage of Labor. Iran J Obstet Gyncol Infertil 2014;17:1-7. Babaii A, Abbasinia M, Hejazi SF, Seyyed Tabaei SR, Dehghani F. The Effect of Listening to the Voice of Quran on Anxiety before Cardiac Catheterization: A Randomized Controlled Trial. Health Spirituality Med Ethics 2015;2:2-7. Akbari M, Darakeh M, Mohammadi J, Rezaie H. The effectiveness of Quran reciting sound on prisoner's anxiety. Teb Tazkieh 2011;20:25-31. Mottaghi M, Esmaili R, Rohani Z. Effect of Quran recitation on the level of anxiety in athletics. Quran Med 2011;1:1-4. Babamohamadi H, Sotodehasl N, Koenig HG, Jahani C, Ghorbani R. The effect of Holy Qur'an recitation on anxiety in hemodialysis patients: A randomized clinical trial. J Relig Health 2015;54:1921-30. Jabbari B, Mirghafourvand M, Sehhatie F, Mohammad-Alizadeh-Charandabi S. The Effect of Holly Quran Voice With and Without Translation on Stress, Anxiety and Depression During Pregnancy: A Randomized Controlled Trial. J Relig Health 2017 [Epub ahead of print]. Mahjoob M, Nejati J, Hosseini A, Bakhshani NM. The effect of Holy Quran voice on mental health. J Relig Health 2016;55:38-42. Shirvani M, Mirzaeian R, Ghaderi A. The effect of Holy Quran sound on vital sign and Spo2 in unconscious patients hospitalized in the ICU. 3th Provincial Congress on Quran and Health; 2013:17-23. Keshavars M, Eskandari N, Jahdi F, Ashaieri H, Hoseini F, Kalani M. The effect of Holy Quran recitation on physiological responses of premature infant. Koomesh 2010;11:169-77. Ansari Jaberi A, Negahban Bonabi T, Sayyadi Anari AR, Aghamohamad Hasani P. The effect of the Koran reciting on the depressed patients in psychiatry department of Moradi hospital in Rafsanjan. SJKU 2005;10:42-8.